CicLAvia takes over Southeast Los Angeles! The communities of Huntington Park, Walnut Park, South Gate, Florence-Firestone, Lynwood, and Watts will host a 10-mile open streets event this Sunday, May 15, from 9 a.m. to 4 p.m. Streets will be closed to cars and open for cyclists, pedestrians, runners and skaters to use as a recreational space. If you don’t mind a longer ride to the event, the folks at CicLAvia also have some other routes between the Green and Expo Lines and the street closures. One-way fare is $1.75, with two hours of free transfer from first TAP, or $7 for a Day Pass. Bikes are prohibited on escalators, and should be transported instead via elevators or stairs at all rail stations. Due to street closures for the event, some buses will be detouring in the area. Please check Metro’s Service Advisory page for more information. For more routes and connections, use the Trip Planner or call 323.GO.METRO. How We Roll, May 11: will Expo2 change the course of human history?! I will be walking from the Long Beach Green Line station to that side of the route. How far is that LB station to that point? According to Google it’s a 13-14 minute walk (about 0.7 miles.) Go north on Long Beach Blvd, then left/west on Imperial Highway. 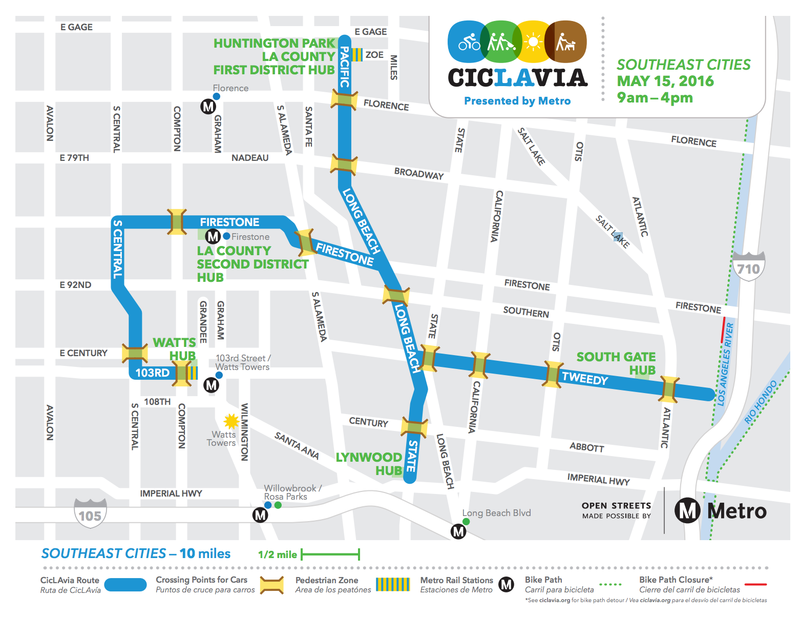 We are super excited about this weekends CicLAvia in the South East Cities. If you are on the Metro or Metrolink train and are taking photographs of bicycles, please help our advocacy by using the hashtags: #bikecar #bikerail — so that we may catalogue bicycles on board trains. And please do not forget to mention us on social media by adding @bikecar101 to your posts — thank you! We look forward to seeing you on the train or at CicLAvia. have a great day.